Welcome to the Players Choice: Best Upcoming Indies of 2018. The following games have been voted on my IndieDB’s community from the Top 100 upcoming nominees, and represent the games those voters are most excited for in the next year and beyond. Starmancer is a Dwarf Fortress inspired space station building game. After a catastrophe on Earth, humanity launches the Starmancer Initiative in a desperate attempt to seek refuge among the stars. Your task as a Starmancer is to construct and manage a colony capable of sustaining human life. Starmancer offers gameplay with consequences, a living sandbox environment, crafting, and managing the daily lives of colonists. Send crews out to mine on asteroids, trade with other factions, or explore old alien ruins. The vastness of space awaits. Are you ready? Griefhelm is a dueling game like Nidhogg, with a 3-directional combat system, meaning that you will need to choose the direction of attack and to avoid getting hit, you'll need to block in the correct direction, or dodge the hit by simply moving (this won't always be an option though). Between the Stars is a roguelike game where you play as a captain of a military spaceship. The final goal is to get to the capital of the Republic to defend it from the attack of the outer worlds. During the journey you will have to make decisions that will affect your ship and crew, buy and upgrade weapons and systems of your ship and fight with enemy ships. Pine is an action adventure simulation game. Based in a world where humans never reached the top of the food chain, you play as a young adult named Hue, tasked with finding a new home for his reclining species. Through diplomacy, combat and exploration, Hue learns to work with and against a variety of tribes that are struggling for survival. Inspired by LucasArts adventures like The Secret of Monkey Island, Day of the Tentacle, and Sam & Max Hit the Road, 3 Minutes to Midnight combines the point & click gameplay and absurdist humor of the “good old days” with high-def cartoon art, an intuitive interface, and a compelling mystery. Splitgate is a fast-paced sci-fi multiplayer shooter that combines the strategic elements of portals with the explosive gameplay of a first person shooter. Built in Unreal Engine 4 and powered through Steam, you can play with friends online or versus the AI. It supports up to 10 players and is revolutionizing the FPS genre with the unique movement and flanking abilities that players can pull off through portals. Neolithic survival real-time strategy. Based back in the stone age era Arisen addresses the difficulties of the beginning of mankind... A player takes care of the tribe settling a harsh environment inhabited by wild animals and competing tribes. He has to build a safe place for generations to come and lead the tribe through all dangers. The Forgotten City is a time travel murder mystery set in a mythological city. Deep underground in an ancient Roman city, twenty-six trapped explorers lay dead because one of them broke a mysterious law. Within, a portal leads back into the past, allowing you to change their fate – or witness their deaths in a time loop for eternity. Fortunately, hope remains. The Forgotten City offers incredible freedom, inviting players to manipulate the timeline, Groundhog Day-style, so events play out differently. By talking with diverse characters, making tough choices in moral dilemmas, and thinking laterally, you can unlock vastly different endings. HYPERCHARGE: Unboxed is a co-op shooter where players assume the role of Action Figures defending a Fortress against relentless waves of enemies. With an emphasis on teamwork, players must upgrade and expand their base to survive against the varied and increasingly numerous swarms of weaponised toys. HYPERCHARGE: Unboxed has the player fighting to defend every inch of territory; it’s a much bigger world when you’re a pint-sized hero. The apparently placid surroundings can be more hostile than you might expect; who knows what lurks behind the shelves or under the bed? 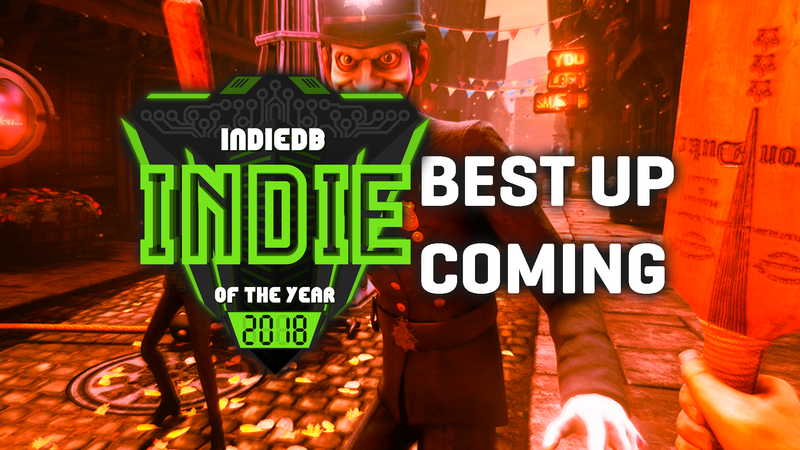 Congratulations to every winner in the Player’s Choice: Best Upcoming Indies of 2018! Further congratulations are in order for every indie game that was nominated and participated in voting. With the Best Upcoming Indies announced, the final Indie of the Year results will go live on December 28. Should have gotten to top 5 in my opinion. COntinue the good work, devs. You have a large community supporting you! Maybe it will be top 5 in Best Upcoming Indie Game 2020. Glad to see another modder turned indie on the list with Forgotten City! :D I'm excited for it too! You're carrying the torch for the impossible odds mate! Get it! Wow! Thank you so much for the support everyone. We are thrilled to have come 1st place. 2019, here we come! Why is #1 the worst on the list?